Attorney General Jeff Sessions reaffirmed the Trump administration's commitment to protecting and advancing First Amendment freedoms on college campuses during a free speech in higher education forum at the Department of Justice on Monday. In his opening remarks, Sessions lauded the strong and intertwined relationship between justice and freedom of expression present in American life since the nation's founding. 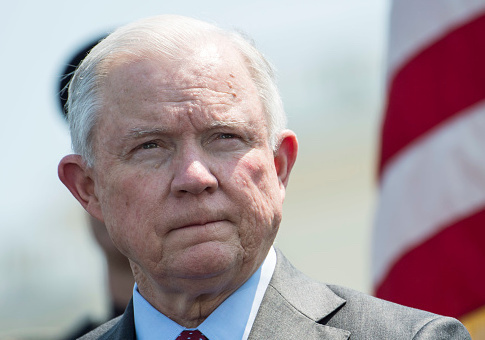 "The passion for justice has been a part of American life from the beginning, but we acknowledge the principle has suffered at times over the centuries," Sessions said. "As Americans, we know it's far better to have a messy and contentious debate than to suppress the voices of dissenters." The attorney general, who in the past has chided the modern university as an "echo chamber of political correctness," asserted anyone who values justice should be disturbed by how strongly freedom of speech is being assailed in institutions of higher learning. "Today, freedom of speech and thought have come most under attack on the college campus," Sessions said. "That should shock us." Discussing instances where colleges and universities have acted to curb free expression—either by establishing overly broad criteria for what constitutes "hate speech" or limiting the exercise to designated "free speech zones"—Sessions reaffirmed the Trump administration's commitment to combatting speech suppression. "Make no mistake, this Department of Justice is concerned about the suppression of speech that is now occurring," the attorney general said. The "protected core liberties possessed by all Americans, even students … are of ineffable value. No third level bureaucrat, committee, [or] top official at any university has the power to take them away." Monday's forum, which was held in honor of the 231st anniversary of the ratification of the U.S. Constitution, assembled the leading voices from government, academia, and the legal profession to discuss free speech in a higher education setting. Since taking the reins as attorney general, Sessions has positioned the Justice Department to more effectively counter efforts by colleges and universities to curtail the First Amendment. During a speech at Georgetown University in September 2017, the attorney general signaled the Trump administration would begin weighing in more frequently on behalf of students who had their First Amendment rights violated by institutions of higher learning. The majority of the Justice Department's actions has surrounded filing statements of interests, in lawsuits brought by students and advocacy groups against college policies governing freedom of expression. While statements of interest do not officially carry the force of law, they do explain to the court in which the suit has been brought what the federal government's position is on the matter. In the past year, the Department of Justice has filed four statements of interest in lawsuits challenging university rules regarding approved campus speakers and designated "free speech zones," among others. One such case at Pierce College in Los Angeles was brought after the school's administration prevented students from handing out copies of the U.S. Constitution. As noted by Sessions on Monday, a number of the statements of interests have already resulted in policy changes that better protect students who seek to express their First Amendment freedoms. In June, the Justice Department filed a statement of interest in a lawsuit brought against the University of Michigan by a free-speech group. The lawsuit accused the university of defining its harassment and bullying policy too vaguely, such that it could not be applied objectively and would result in students being disciplined for comments that anyone could find "bothersome." Shortly after the statement of interest was filed, the University of Michigan updated its student conduct policy to provide a more narrow definition of "harassment" and "bullying." In his remarks on Monday, the attorney general said there was still much work to be done given the number of "radicals" still seeking to censor free speech. "There are radicals out there that have openly and systematically justified actions that would deny Americans the right to speak out against their favored ideological agenda," Sessions said. Citing the abolishment of slavery, women's suffrage, and the civil rights movement, Sessions lambasted the growing number of "campus bureaucrats" who take it upon themselves to ordain what speech is positive and what speech constitutes a public disturbance. The attorney general argued such actions are not beneficial to protecting anyone as the advancement of society has never occurred without disturbing the deeply held beliefs of at least one group of individuals. "Change has never been effected without disturbing the comfort of persons," Sessions said. "And likely never will." Sessions said the efforts of colleges and universities to curtail free speech had "gone too far" and "must end," especially as such actions were in conflict with the nation's founding principles. "Whether left or right, suppression of competing voices is not the American way," the attorney general said. "We have reached a pivotal, perhaps even historic moment. It's time to stand up to the bullies on campus [and] the bullies in our culture." This entry was posted in Issues and tagged College Campuses, Department of Justice, Donald Trump, First Amendment, Jeff Sessions, Speech, Trump Administration. Bookmark the permalink.